Womyn Powered Food: Tejal Rao — Diaspora Co. If you’ve ever read anything by Tejal Rao, you probably won’t be surprised to learn about her deep love for poetry. Whether you’re reading her case for canned tuna, her review on Mission Chinese Food, or her piece on 100 women in California coming together on a farm to make traditional Vietnamese banh chung for Lunar New Year, Tejal’s writing is genuine and lyrical, making readers feel connected not only to the food, but the people and communities that give it life and meaning. Tejal, who credits her knack for reporting to her diasporic upbringing, was born in London, but moved around every year or so to places like Kuwait, Khartoum, Paris and Atlanta due to her father’s job. She adapted quickly just like she’s doing for her recent venture. 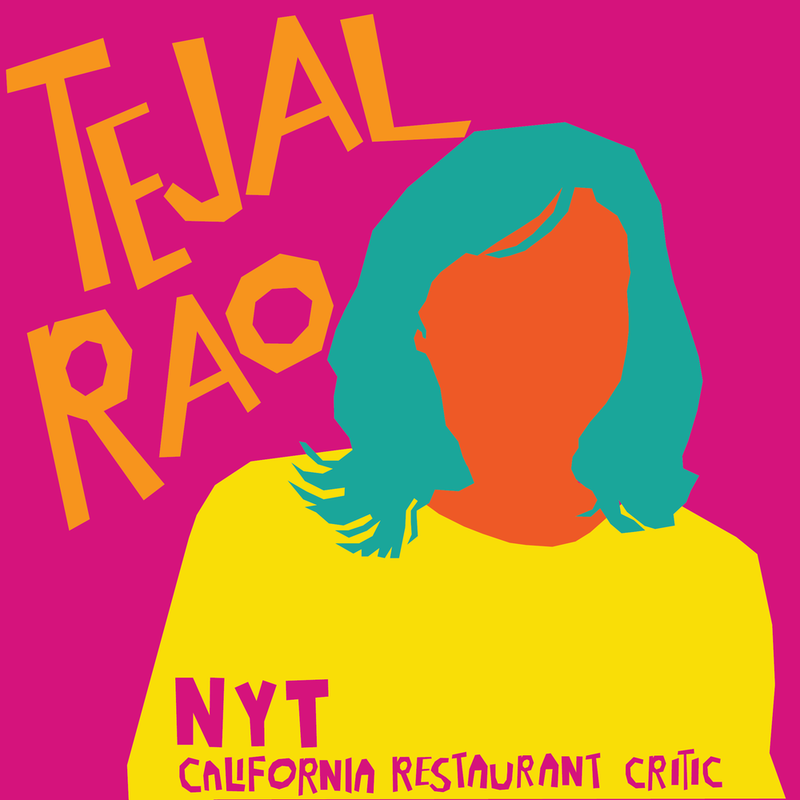 Last fall, after living in Red Hook, Brooklyn for a decade, Tejal moved west to Los Angeles after being named the first California food critic for The New York Times. Tejal was a food reporter for New York Times and is still an Eat columnist for New York Times Magazine. Before her post at New York Times, she was a restaurant critic at Bloomberg News and previous to that at the Village Voice, places she won James Beard Awards for restaurant criticism. This year, her fascinating New York Times Magazine deep dive on the story of Kit Kats in Japan was nominated for a James Beard in feature reporting. As a kid, you moved around often. In what ways has a diasporic upbringing shaped your approach to food, culture, and storytelling altogether? Moving a lot meant I learned to pay attention, take in details, adapt and code switch really early, and to carry around this fluid sense of self. I've almost always been an outsider, and I'm most comfortable observing and asking a lot of questions from that position, which works out well if you're a reporter. I’d love to learn more about your process. How do you find stories like A Day in the Life of a Food Vendor? Reading about how readers crowdfunded Mr. Ahmed’s family vacation made me cry big juicy faith-in-humanity-is-restored kind of tears so thank you for that. That story came out of a conversation with Sam Sifton. He wanted to know more about the culture of halal carts in the city, in a general way, and he kind of sent me off to figure out if there was a story there. On and off for months, I interviewed cart owners and vendors to find out what issues were top of mind, until I met Kabir. I met up with him a few times before I finally asked, like, can I come to your house at 6 in the morning and meet your wife and kids spend the whole day with you, because I want readers to see you as clearly as possible. He said yes, and the story came out of this one long day. You once wrote, “Food writing without even a hint of snobbery or judgment is a real pleasure.” In your opinion, what cultural elements are erased when elitism creeps into the stories told about food? I was referring to Ruby Tandoh's work. She does that so well. Her work is inclusive and smart and insightful. I guess what I meant is that in work like that, in writing that comes from a more intersectional point of view, there's space for details and tension and complications which don't just make a story more fun to read (which they do!) but they also make a story fuller, more honest, more full of dimension. How has moving to California from New York City and stepping into a role as a restaurant critic impacted your professional evolution? I don't know yet! It's still so new and the truth is that I'm figuring it out as I go along. I'm not strategic at all about my work, I just plod along obsessed with one or two stories at time. So, I'm still doing that, but now it's criticism. Do you feel that you’ve had to rejigger the process in which you find stories or restaurants to write about in any way? Has the move and new role been challenging at all? New York was deeply familiar to me and California isn't, so I'm out and about a lot right now, driving around, eating, talking with people and just trying to understand it and take it all in. The process is the same as always, which is to say, informal and intuitive and messy. In many ways, I feel that you are decolonizing food media by the stories you tell and how you choose to tell them. You are such a strong voice on the championing for depth and detail in food media. I’d like to know what excites you most about the people and food you’re writing about? I care about the work so much. I love reporting because it's like this continuous, totally unstructured education. But what I like best is to have all the reporting and research done, and a whole afternoon ahead of me to think and to write and to figure out how to get the reader as close to the story I want to tell as possible. I love that. Shameless plug - What’s your favorite way to use turmeric? The way I use it most often is in a vagaar, or a tadka, which is the genius technique of infusing hot fat with some ingredients and then using it to season a dish. The simplest version of that would be: Melt some ghee in a little saucepan then add a half teaspoon of turmeric with some cumin seeds, hing and dry red chiles. When everything is sizzling, tip it all into a pot of cooked lentils and stir. Done. I also make a black tea with some honey, spices and turmeric which is very similar to what my grandmother used to make for me if she caught me coughing, or even if I just looked a little down in the dumps.